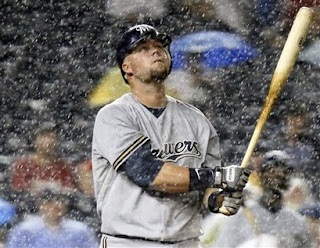 Well, the 2009 MLB season will end with little fanfare for the Milwaukee Brewers. After a run in 2007 and a Wild Card berth in 2008, much was expected of the 2009 team. The simple fact of the matter is, everyone knew that the pitching would be the downfall, and it was. Sure there was that nice stretch in April/May that made us all believe, but reality, along with some injuries, caught up quickly. Some people are talking about selling off players like Prince Fielder to start a new rebuilding process, but I don't agree with that. I don't foresee a dominant Brewers team in 2010, but I can envision a competitive one, and in the NL Central, that is all you need to have a chance. General Manager - I'm going to go ahead and say that Dougie keeps his job as the GM. He wasn't given much to work with last off-season from free agency, and as per usual, the trading cost was too high at the deadlines. His one glaring blemish still on the team (Suppan) will be in his last year of his contract, but if I remember correctly, much of Brewer Nation was happy at the time of that signing. Managers - Mark A. says it is up to Doug, and Doug is usually not a reactionary guy, but I think Macha will be out. Is it fair? Probably not. Macha probably could have gotten on the mound and pitched better than some of the pitchers at times. However, his management of the bullpen was at times mind boggling, the seeming lack of emotion frustrated many, and his annoying, but consistent, need to set lineups and matchups on historical data as opposed to riding the hot hand is maddening. My initial prediction for the next skip is Willie Randolph, and if the Brewers don't, the Astros might. With Randolph, the Brewers wouldn't lose any unfamiliarity and Willie is a proven manager. My heart wants to say Dale Sveum, but I think he loves/thrives being the batting coach. 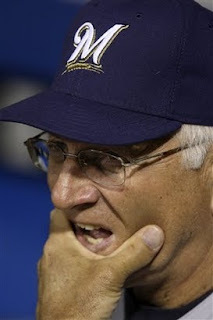 Also, it would be interesting to see if the recently fired Cecil Cooper comes back to Milwaukee. Also, I predict Stan Kyles will be let go, and a familiar face, name Bill Castro will be rehired as the bullpen coach. I've been scoffed at this, but don't tell me you couldn't see it happening. Catchers - Mike Rivera seems to prove he belongs, but can you trust a whole season with him as your main catcher? Sorry, Jason Kendall will be back with a one year deal. I thought about having Rivera/Salome combo because fact of the matter is Lucroy needs to move up to AAA next year. Then I thought that Salome could be good trading fodder. First Base - Here is one that is becoming a topic of debate. 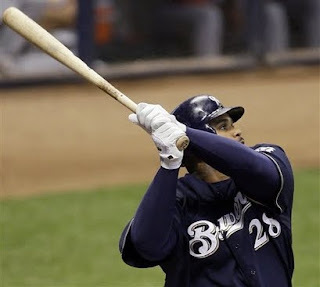 Do the Brewers trade Prince Fielder while his value is as high as it can be, after coming off MVP type numbers in 2009? Not to mention, Prince has 2 years of control left? My thought is, no. I think Prince Fielder will be back manning 1B. He is too popular a figure and too important to the offense. Selling him now is giving up on next year. I think the majority of fans would start to get the "same old Brewers feel" and the turnstiles would see less action. Prince puts butts in seats...fact. Sure, Mat Gamel would probably make a good first baseman, and you might not lose too much production from that spot, but don't look for that to happen unless the Brewers are already out of it come trading time. Unless you can get a Tim Lincecum (and you wouldn't), it would be a bad deal. Second Base - Another interesting one. 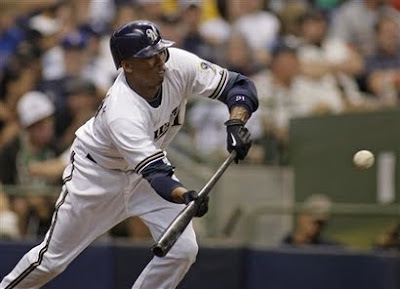 Felipe Lopez has been nothing short of awesome during his time as a Brewer in '09. He is a true leadoff hitter, which was something the Brewers were lacking, and his switch hitting ability makes him even more valuable. However, Rickie Weeks will be back. We have no way of knowing which Rickie Weeks we will see in 2010. We aren't even sure if his start to 2009 was a fluke or not, and we aren't sure if this injury will set him back. After some thought, the starting second baseman will be, Rickie Weeks. Sorry folks, the Brewers will offer Flip arby, but he will deny it and the Crew will get a compensation draft pick or two out of the deal. Third Base - Infielders, infielders everywhere! Casey McGehee is having a tremendous rookie season for the amount of time he has seen on the field. At the same time, Mat Gamel has to be up and playing everyday next year. Many people are saying Gamel should try to make the move to the outfield, but moving players around might not be the best idea (ex. Bill Hall). Sure Ryan Braun's move worked wonderfully, but would Gamel be able to do it? Opening day starter at 3rd, Mat Gamel. McGehee's ability to play 2nd and 3rd makes him a valuable utility player, but the real reasoning will be that Gamel is supposed to be a franchise type of guy, you have to give him the shot. Look for McGehee to play almost everyday still. Shortstop - Sorry J.J., the ladies from another team's fan base will certainly be glad to see you, and the Milwaukee girls will have to move their swooning elsewhere. It was made evident what the Brewers intentions are with J.J. earlier this year. Alcides Escobar has not disappointed and will be awarded the SS in 2010. Escobar's leadoff ability will be what makes Felipe expendable, and J.J.'s missing power numbers can hopefully be made up by Rickie Weeks. Hardy will have to be traded though, and hopefully J.J.'s value, coupled with another player, will draw a good young pitcher for the Crew. Left Field - Easiest one to pick, Ryan Braun. I could foresee Braun moving to right field depending on what the Brewers decide to do with the rest of the OF, but for now we leave it alone. Centerfield - The Brewers biggest hole in the field by far for 2010. Mike Cameron's contract is too rich for them to offer arbitration, as he would likely accept it and get a raise. I would love to tell you Cameron will take a discount and stay in Milwaukee, but his defensive prowess and his OPS will be coveted by teams that have the cash for him. If he were to stay, the likelihood of putting an inexperienced, say, Mat Gamel, in right could be more plausible. Another possibility in center is Hart, with Gamel once again in right, but talk about a poor defensive outfield. Jody Gerut will come back and take the duties in center. 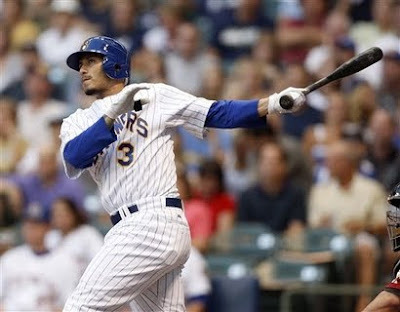 Right Field - I mentioned the Brewers could potentially try out Gamel in the outfield and see how he performs, but that is what I want to happen personally. Realistically, unless he gets traded, Corey Hart takes his usual spot with the Brewers. Starting Pitchers - Like it or not, Gallardo, Parra, Bush, and Suppan will all be back. That leaves one open spot and no one from within to fill it. The free agency is bleak, and Melvin learned his lesson on Suppan about over paying players. Unless he can get Lackey on a one or two year deal, this spot will have to be traded for. The potential players to be traded, Hardy, Salome, or even Hart. Honestly, I wouldn't be too surprised if Gamel is dangled as well with McGehee's great 2009. Bullpen - Ladies and Gentlemen, watch as Trevor Hoffman gets save #600 in a Brewers jersey. Hoffman doesn't sound like he wants to move again, and the Padres aren't going to replace Heath Bell with a closer they all but discarded. The Brewers would be stupid to not offer Trevor arbitration, and he will likely accept that offer. Also expect Coffey, Villanueva, and McClung to return. The rest of the spots will depend on free agent signings and performances out of camp. Not being able to foresee those signings or performances I'll stick with what the Brewers currently have. I think Chris Smith has done enough to stick around, and Mitch Stetter for now is the incumbent left handed specialist. Mark DiFelice had a great start to 2009 and seems to be popular in Milwaukee, so he can stay. Bench - The bench can be extremely valuable as we all know. Craig Counsell has had a resurgent year and will likely let the Brewers get the hometown discount once again. I've already mentioned Casey McGehee's possible role. Mike Rivera backs up Kendall once again. Jason Bourgeois will be the 4th outfielder. I think Corey Patterson will get the boot, but for now he'll stay and be the designated 'guy everyone hates'. Let us know what your thoughts are, or what you think may be wrong. If Kendall is back at Catcher, I will not be going to any Brewer games next year!!!!! I'm the opposite--I love Kendall behind the plate, and would be more than happy to see him come back next year. I don't understand the hate he gets. Unfortunately I think next year we'll see a platoon again at 3rd base with McGehee and Gamel playing the part of Hall and Counsell. It really is a perfect fit--both are solid 5 hitters, so the line up wouldn't shift much. I just don't like platoons. No love for Claudio Vargas? I hated Vargas as a starter, but I love him as a reliever. He's also been one of the most consistent pitchers since his acquisition. This is my hoping roster. I agree with lange and dbauhs. You guys/girls are correct. 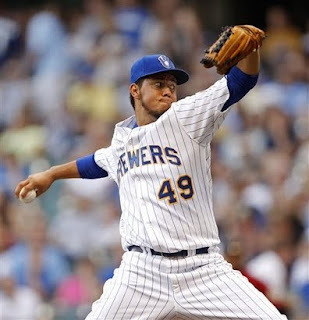 I Really wish the brewers will understand that these are star players and to keep them! Reply, tell me I'm wrong or right.